One of my project is using Node.JS running on Ubuntu Linux server. To send email, I am using email module. This module itself is just a wrapper for Sendmail. 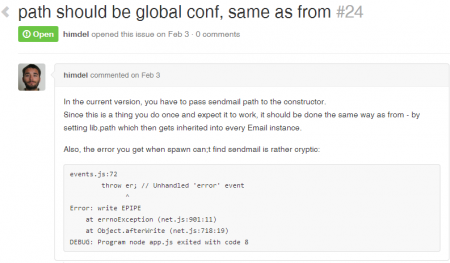 So you need to ensure that Sendmail is already installed and working properly in your server. //do something when email is successfully sent. When testing this module, I can send out email successfully. So I didn’t foresee any issue coming from it. But lately I started to receive reports that emails were not sent out. First, I checked Sendmail’s queue using mailq and sendmail -bp, but I found that the queue is empty. It seems the email module was throwing unhandled exception. But I can’t make any sense where the error is actually originated. 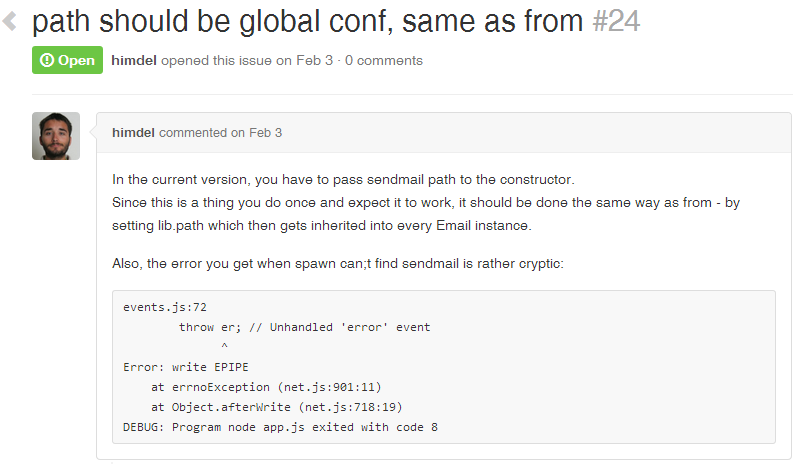 Hoping that someone already resolve this issue, I visited the module’s github issues page. Lucky me, I found that other people is having the exact same problem as mine. Voila! The emails now sending out successfully.